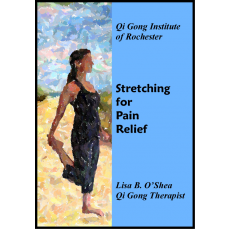 Qigong exercises train the energy to move properly through the body as well as flush out blockages. When energy has been stuck or stagnant in a muscle for a long period of time, that area of the muscle will develop a physical contraction there. This could result in a knot in the muscle or a “trigger point” according to Dr. Janet Travell. Qigong exercises can assist in flushing out these trigger points but may not be the quickest method when used alone. Stretches developed by Travell have been very successful in returning the functionality to these muscles in a very timely fashion. Changing the energy changes the tissues, and changing the tissues changes the energy. The following clip from this DVD is of the Levator muscle stretch. This stretch helps with pain between the neck and shoulder blades, pain along the edge of the shoulder blade closest to the spine, and also with a painful stiff neck.